With the sustainability movement now as popular among college students as Jell-O shots, most schools have taken giant leaps forward with their environmental commitments. These three, however, must have missed the memo. 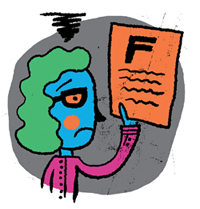 Texas Tech The Lubbock university flunked our 2008 sustainability test, and this year its grade has not improved. In fact, it placed lowest among schools that responded to our survey, offering no sustainability initiatives to speak of. DePaul University The Chicago institution scored zero in the administration category--perhaps the most effective measure of a school's interest in the environment. DePaul has failed to reduce its impact on climate change because its officials have yet to conduct a greenhouse-gas-emissions audit of the campus. Those failures are all the more disappointing when you consider DePaul's excellent academic reputation and healthy $345 million endowment, none of which is invested in environmentally responsible funds.